Chevrolet is very interested in letting you know that they’re “on fleek” with “the youths” these days, with their pocket-Victrolas and rat-tail haircuts and all that. 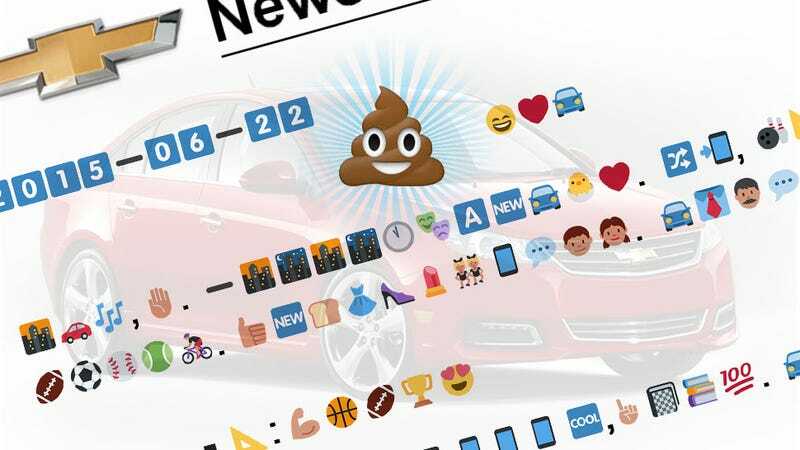 Just to be really sure we know how down they are, they just issued a Chevy Cruze Press Release all in Emoji. Now, I don’t know about you, but I’m a busy man and can’t just wait for 2 p.m. Tuesday for a translation — I need it now. The current state of computerized Emoji-translation is still woefully inadequate, and the only living native Emoji-speakers known are currently kept in a special high-security enclosure in Harijuku, Tokyo. Luckily, I have two years of Emoji study at Vasser, and I spent two weeks in an intensive Emoji-immersion program where I was liquified and injected into the brain of a 15-year old girl. I can handle this. • Right angle: Strong sports trophy will fall in love. • Graph: Seven phones cool, 100% of books are number one. Cars love phones. Diamond scream. That computer. Music on low volume. • Chair: Walking man, Salsa dancer, twin Playmates, answer woman. • Gasoline: 2105:35/Bridge to 2016, up great job, much adulation, applause! Time passes to July 15, trending upward. • WARNING: Think about a lot of luggage. Bidirectional OnStar. • Car: Soon, to drive to flowers. • Car: All major continents. Car sunrise over the mountains, starry night, sunset on the water; mountain rainbow, a day passes in the city to the Golden Gate bridge at night! Car phones gasoline rollercoaster, 100% love checks out. Search 1911, pin the city of the music car on the map, then stop. Chevrolet in all continents. Chevrolet to gasoline love jazz hands.